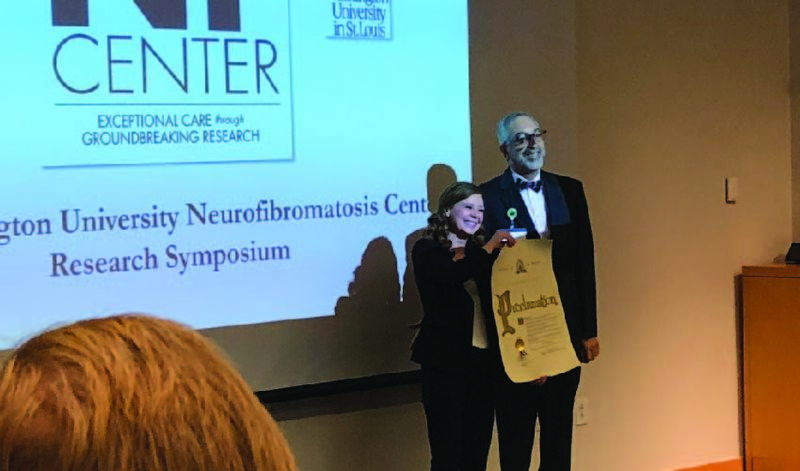 Washington University marked 25 years of NF research by hosting the NF Center Research Symposium on September 5, 2018. Dr. David Gutmann, Director of the NF Center, put together an outstanding line-up of leaders in research and patient care to share their expertise. The keynote speakers were Dr. Eric Legius, Professor of Human Genetics at the University of Leuven, Belgium, and Dr. Frank McCormick, Professor of the Comprehensive Cancer Center at the University of California San Francisco. Dr. Legius spoke about Legius Syndrome, a condition that occurs in roughly 4% of NF1 patients; Dr. McCormick discussed his research on the NF1 protein as a key regulator of RAS. In addition, several members of the NF Center’s team spoke about their specialties, including psychiatry, radiology, oncology, and physical therapy. Kim Bischoff and Sharon Loftspring attended the symposium. The message they gleaned from the presentations was that NF research, in general, is targeting the identification of genomic risk factors that will lead to precision medicine, to “demystify the trajectory of the patient.” That research is gaining momentum. Now, more than ever, the NF Network’s advocacy for federal research dollars is critical to maintaining that momentum.